A somewhat unconventional action picture that spends a great amount of time setting it’s story up with origins and clever plot ideas. This movie is enjoyable as a somewhat different kind of superhero movie, but it’s far from great. The best things about it are the period piece presense, which really captures the young men going into World War II attitiude, and the story about a wimpy kid turning into a super soldier. i especially liked the ways he was first used for advertising and selling war bonds, before seeing any real combat. The action itself is just okay. It’s fun when captain america throws his shield around, but other than that, this is pretty routine stuff. the villain might look cool, but every one of his lines is cliched, and in a lot of ways this ends up feeling like the same old usual thing. The film wants to be like Raiders of the Lost Ark, and it does get some of that feel down, but it also goes a little too heavy at computer effects and not enough at realism. the guns that shoots blue laser blasts certainly don’t help. still there’s a lot to appreciate and enjoy, and in an escapist b movie kind of way, it’s a lot of fun. Captain America: The First Avenger is the last of the Avenger heroes to get his own movie before we actually get the Avengers movie, next summer. In that movie, all of the heroes will join together. Before him we had Iron Man and The Hulk (both in the summer of 2008) and now Thor (with Captain America, both released in summer 2011). The amazing thing is that every one of these movies has been good! I say amazing because it’s rare that you can see three movies these days and all three of them be good. and it’s not so easy to make a good superhero movie either. just look over at d.c. the company that tries to compete with marvel, both in comics and superhero movies. d.c. has had great success with the batman franchise under director christopher nolan, but the brian singer superman movie and the recent green lantern movie were both terrible. not to mention the joel schumacher, cartoon-like batman movies. it’s hard to make a superhero movie, and yet, somehow, marvel finds all kinds of ways to do it right. all of the x-men movies, the fantastic four movie, even two out of the three blade movies. and that was all before marvel became it’s own studio with the release of iron man in 2008 (some of the films that were turned out before that time like daredevil and elektra were lousy, but once marvel got it’s own studio, the projects have all been great, one after the next). Captain america isn’t quite as good as some of those others, but it’s still a lot of fun. credit that to the producing team (led by marvel films’ kevin feige), to get a good director just like they have for each of these films. for the iron movies they got john favreau, hot off the press and ready to deliver (it was his first action movie, unless you count zathura). For thor, they got kenneth branagh to direct. the cinematic expert on shakespeare and how to adapt the bard’s work for the screen. thor is a comic book with a storyline about family issues and conflict between sons for their father’s kingdom, and it was right up brannagh’s alley. 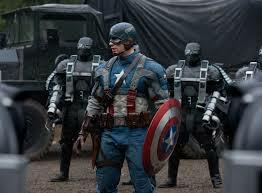 and now, for captain america, they hired joe johnson to direct. this guy is a pro at period piece movies from the first half of the century. he did some of the production design work on radars of the lost ark before going on to direct his own movies, the rocketeer and october sky. what interesting choices from marvel. with exception to hiring louis letterier to direct the incredible hulk (letterier had only made the transporter movies, which were pretty lousy), there choices for filmmakers have all been pretty smart. letterier’s movie ended up being the worst of the bunch, which should come as no surprise at all. and since then, marvel has learned from it’s mistake. even the star of that movie, edward norton, was handed a pink slip and shown the door. for captain america, joe johnson is just right as a director. he’s smart enough to know the movie can’t be just about action. he knows it has to be about the time period and what was going on in the world. the movie takes place during the time of world war II and has a large focus on advertisements and public conception of the war. it seems like every young man with something to prove wants to be a part of this war and to be the one to personally take down adolf hitler. steve rogers, played by chris evans, is no exception. the problem is, he’s a weakling. he’s an asthmatic with no muscle and a tiny frame, but he’s got the heart of a lion. he’s tough and optimistic to a fault, and never gives up or stays down, kind of like rocky. he’s the ultimate underdog, and early on we see him get beaten up in an alley by a guy twice his size. rogers has a friend named bucky barnes who is shipping off to war. before he goes, rogers has a conversation with him about how much he wants to go and fight, and how he keeps getting rejected on account of his weakened physicality. stanley tucci, a scientist who is working on a special project, overhears this conversation. Tucci enrolls rogers in an army training camp under the command of tough guy general tommy lee jones (what a cast!) Jones puts steve rogers through the ringer, and rogers fails at almost all of it. there are, however, funny scenes on the occasion that showcase how rogers is the kind of soldier who uses his mind instead of his muscle. there’s the scene, for example, where he finds a way to get a flag down from a flagpole that nobody else can reach. rogers is carefully watched by tucci, and he is eventually picked to undergo a special operation. the operation puts him into a machine that transforms him and gives him the physicality he has always desired. suddenly he has huge muscles. a german spy attacks and rogers goes after him, running through the streets, diving into the water, and bashing through a submarine to catch the enemy. the running part might look a little fake, but otherwise it’s still a good scene, giving us a taste of what this new rogers is capable of. 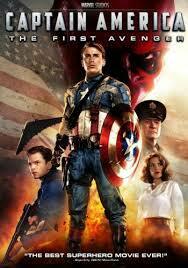 the enemy of the movie is a nazi weapons division leader known as the red skull. he’s a great villain from the comic books and hugo weaving brings him to life nicely here. i didn’t love how once weaving took off his mask and showed it to captain america, it stayed off for the rest of the movie. that didn’t seem to make sense. unless he was going out and showing it to the world, why did it stay off from that point on? For the movie, i understand that once they reveal the big surprise of what his face looks like, there’s no point of going back. But for the character, and storyline, it doesn’t quite add up. if he’s always kept a mask on to talk to his associates before, then why does he suddenly stop now, just because he showed it to captain america? the movie does not have the newly enhanced rogers suddenly go out and fight. instead, it gives us a wonderful act where he is used for military propaganda by the u.s. government to help recruit young men to go to war. he becomes a performer on stage with a bunch of women. he’s an icon, lifting up a motorcycle over his head while red, white, and blue fireworks go off behind him. but this is not what he wants to be, and when he goes to give a motivational speech to soldiers, they are less than interested. this plot line about him being used for advertising ends up doing two great things for the movie. it gives him the red, white, and blue costume, which is meant to be over-the-top campy instead of taken seriously, and it also gives him the name, captain america, which makes much more sense when used in adds and shows. but rogers the man still has to prove himself. as the movie goes on, he finds that he can’t just wait around for the opportunity to come to him. and so he goes on a rescue mission of his own, and comes back a hero. the movie goes on from there, having rogers handpick a team of men to lead on secret missions. all of this makes for a pretty interesting plot. and the action is great too. captain america uses his shield like a giant hammer, bashing around enemies and even throwing it at them like a razor sharp frisbee. the movie is smart in the way that it takes it’s time to give us an intelligent plot. and the way it starts and ends with the discovery of the captain in the modern world is pretty cool too. joe johnson has made another winner for marvel here, and this one is smarter than most. the action and computer effects are sometimes a little silly, but the storyline is well-crafter and it propels the movie through every challenge.